Purani Jeans was the track that made Ali Haider one of the most influential singers of the ’90s. The melody and lyrics that stayed with generations and crossed borders beautifully encapsulate the slices of college life that make young people feel proud of that old pair of jeans in their closets. Indeed, Purani Jeans took over walkmans and stereos, …building on the trend of youth-centric music that had been triggered by Nazia and Zohaib Hasan’s Disco Deewanay in the late ’70s. After staying away from music for personal reasons, Haider has returned with a brand new album titled Bachpan Ki Badaami Yaadein. According to a press release, the album was scheduled for a nationwide release on March 25, but is still not available at local stores. Those who wish to listen to the tracks can catch it playing on television. Bachpan Ki Badaami Yaadein is an easy listen. With a catchy chorus and upbeat melody, the track has the pop rock feel that Haider’s fans are accustomed to. The songwriting and musical arrangement is not extraordinary, but do justice to a song that relies heavily on the lyrical content and Haider’s soothing vocals. An average music listener who listens to everything from Imran Khan to Coke Studio will definitely like this track. The poetry is not very different from Purani Jeans. From the lyrics “Woh raaton ko jaagna, subha ghar jaana kood ke deewar, woh cigarette peena gali mai jaa ke, woh karna daanton ko ghari ghari saaf”, Haider has moved to “Mummy se ro kar, shaklain banana, kehna stomach upset hai, papa nae ghusay mein jo marora, kaan abhi tak upset hai”. The song is yet another case of Haider banking on the element of nostalgia to create memorable music. But will the same formula work two decades after Purani Jeans, in an environment where the music industry’s survival centers largely on satirical tracks and internet sensations? Even if it is somewhat the same, the flipside is that it is accompanied by a well done video, which targets Indian and Pakistani viewers. The video, which was filmed in India, shows the protagonist ‘Mummy’ dressed up like an Indian housewife, complete with a sari and bindiya. With the dismal state of the Pakistani music industry, Haider has picked the right market for what could possibly be his last resurrection. With the kind of following he has in India, we could be looking at another five years of glory for the singer with looks of a chocolate hero. Too bad he’s married, ladies! The rest of the album includes an interesting mix of satirical and sufi music mostly written by Haider himself. There is also popular sufi poetry such as Dum Dum Mast Qalandar and Bulleya Kee Jaana and Allah Hoo. Funny songs like Babu Seedha Sadha and Sare Munday Lag Gaye show a lighter side of Haider. 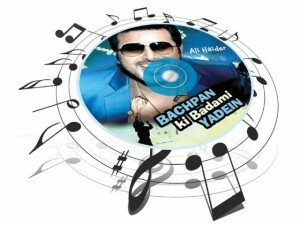 Bachpan Ki Badaami Yaadein hasn’t got the best response online, but the back-to-back requests for it to be played on music channels will give you some indication of its popularity. The important question now is whether or not Haider will bag a Bollywood deal after this album — isn’t that the only way ‘forward’ for Pakistani musicians in a struggling industry? Published in The Express Tribune, April 17th, 2013.